Welcome to Day Three of our Christmas Gifts in July. 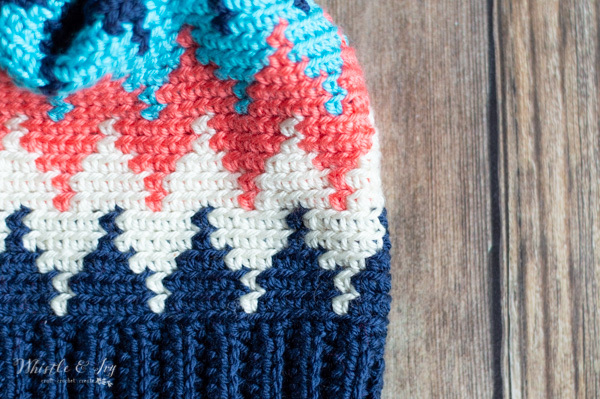 This pretty hat is another color work project. 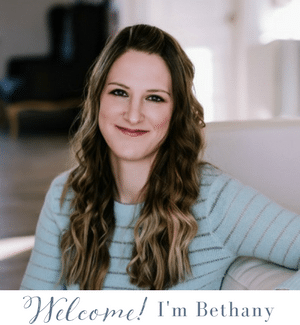 I am hoping that you have tried it and are hooked on this fun technique. 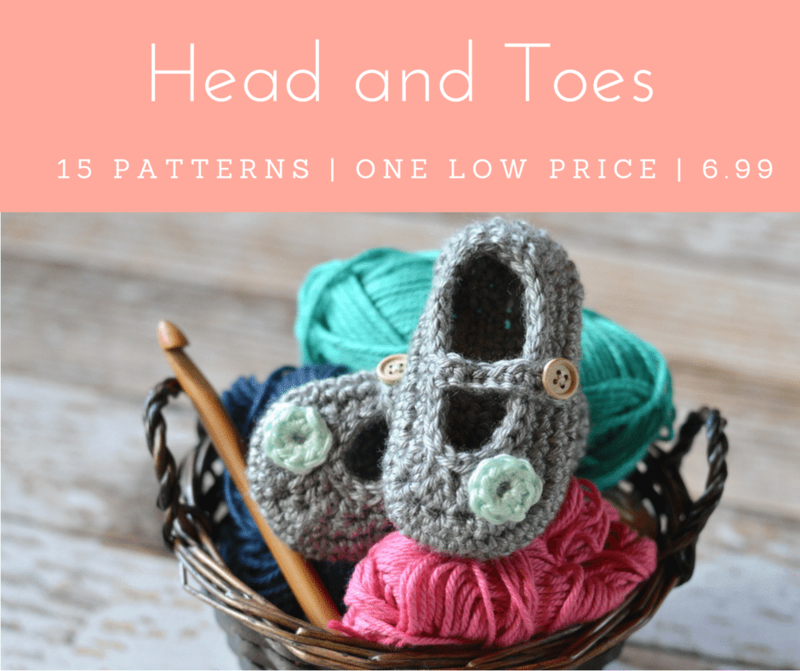 (If you haven’t tried crochet color work yet, be sure to watch the video below, it’s easier than you think!). This graph is quite simple and only alternates between 2 colors, making it one of the simplest color work graphs you can find. But the finished effect is stunning! Repeat row 2 until your band reached approx. 19″ (or until it fits your head snugly). Achieve this measurement by gently pulling your band. You want the hat to be snug. Work the hat body in BLO, this allows the stitches to line up properly. Note: To work the color work, be sure to carry your unworked yarn and alternate back and forth according to the graph. You will only be working with two yarn colors at a time. 1. Ch 1. Sc around the top of the band, echieving 72 total stitches. Join. 2. – 25. Work the graph, repeating it 12 total times to complete each row. Each square on the graph will be one sc. You will begin each round with a ch 1, and end each round by sl st into the first st. Be sure you are working in BLO so the graph lines up properly. After you complete row 25, tie off and leave a long tail. Turn the hat inside-out. Using your long tail, sew a loose running around the top. Pull the end, cinching the end shut. Tie a firm knot and weave in the end. Turn out right-side out. 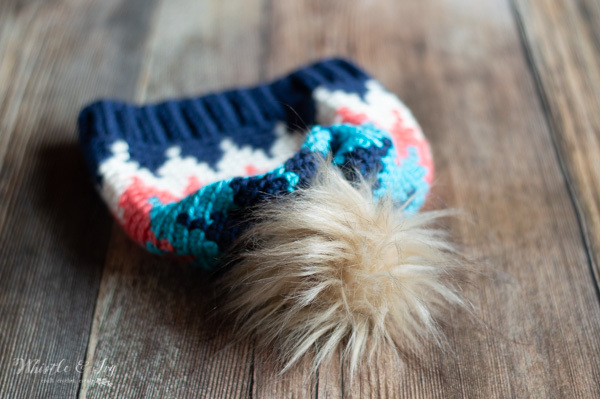 You’re new favorite crochet hat, perhaps? I can’t wait to see your version! Be sure you share it in the group. 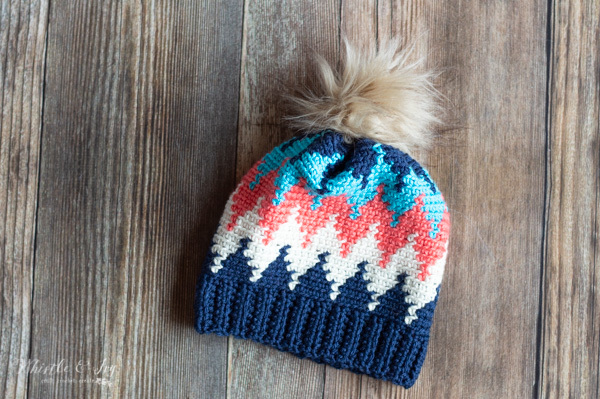 Love this crochet chevron hat? Subscribe! Tapestry crochet has less stretch than other techniques, so you definitely want it to be a bit loose! Could you tell me how many rows do you crochet in the brim? How do you distribute the 72 sc of the body first row around the brim if it has less than 72 rows? Because your brim may have more/less rows than me, it’s a bit tricky to explain. The easiest way it trial and error, and stop at the middle and try to have about 35 midway through. What size hooks do you use to do the hat? I want do a hat gor my baby he has 18 months. O have yarn size 3.5mm and hook 4mm it was ok? 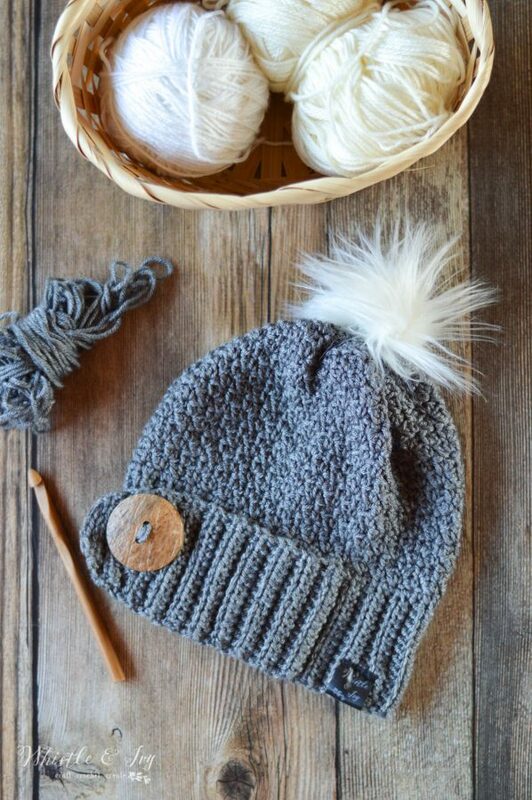 This hat is for an adult, so you would need to do a bit of tweaking to make it for a child. You would need to work the graph less times to the hat was smaller. I am sorry, I don’t have this pattern figured out for other sizes yet! Just made the band and as stated you’ve said make it to fit your head. I’m making for my 10 yr old daughter her head measured 21″. So I went to 19″ like stated. When I go around for the body in SC I am only getting 56, is there a certain number so that the graph will work? Multiples of 6? Etc? As in if I make the band and only get 60 stitches will the pattern work? 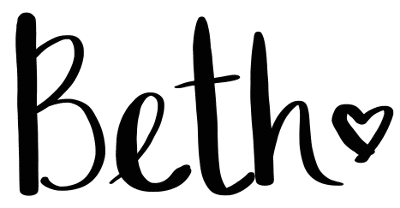 As long as it can be divided by 6 equally or?…. Yes, as long as your 1st row is in multiples of 6 it will work. Did you work a gauge swatch? 19″ is for an adult, so if you went down to less stitches around the body, then your hat would be very tight, while having a loose brim. I guess I may have not been clear about what your original question was. The hat is quite basic ( a brim that fits your head) and a sc in each st around. If it’s too tight, as with all crochet projects, it’s a gauge problem. To fix a gauge problem you would need to adjust hour hook. The pattern is on this page, just scroll until you see it. Lovely pattern. I was wondering, is this supposed to turn out as a slouchy or a beanie hat? Mine ended up being long, like a slouchy, but I was expecting a beanie. Thank you for your time. yes it’s more of a slouchy fit. You can work less rows to make it more fitted. When you join with SL, are you joining with your working color (first few rounds off white) or with your next color change (navy)? My stitches aren’t lining up and look “cut” but the alternate color. The join will never look perfect, but if you join with the color you will use next it will look a bit better. You can even take it a step further and end the last st with the next color. I go back and forth as to which I prefer. I love this hat, but it is a little too tall. If I make another, I’ll likely end after 21 rows. Great pattern though! 8 is a typo, I am sorry! You should have 7 total stitches. Thanks for catching that! When you are ready to drop a color, what do you do? do you tie it off somehow to keep it from unraveling?? When I am done, I go back and weave in the ends. It should actually work fine! The pattern is continuous, so even if it was “backward” it would still look fine. Hi, in the hat body do you turn after each round or just work continuously around ? Started this pattern and am a bit confused. At the end of the second row there’s a white stitch. The beginning of the 3rd row is a white stitch. I’m confused about what color to join and ch 1 with before starting the 3rd row with the different color. You are beginning row 3 with a navy blue stitch (the graph reads from right to left on each row), so work the last white stitch of row 2, by pulling through with navy blue. Then continue with navy blue to join and ch 1. I don’t yet, I am sorry! But you can view it on my blog anytime. 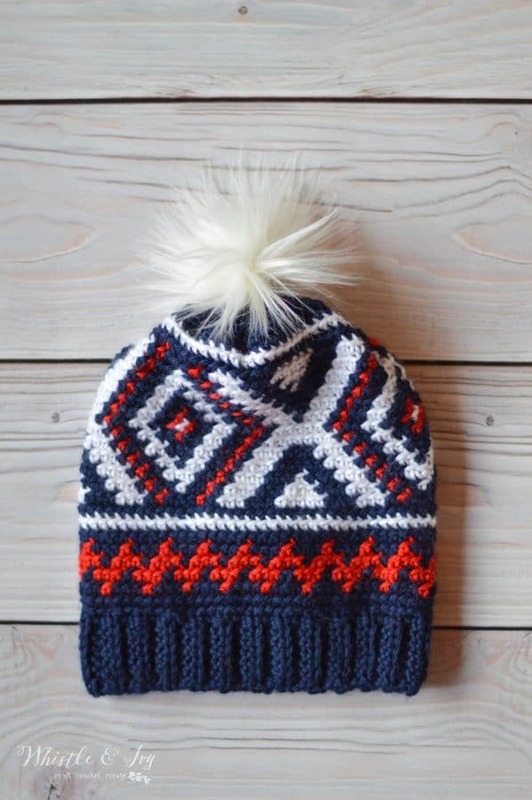 Beautiful hat I would love to make it. Please tell me what BLO means. I loved to find your Tutorials and Videos. After a stroke, I am coming back to Crochet, and Your Videos are the best therapy . I love the way your hat turned out in the picture however my hat was super tall and very tight as I worked up. :( and for some reason my band was wider than the bulk of the hat which I don’t like. Your hat is beautiful though. It sounds like your gauge got tighter when you started working the graph. I suggest maybe going up a hook size or two when you start the graph. When working thr graph, do you start at the bottom right corner with the blocks of 4 blue then move to the left with 1 white and go up in rows from there? This is my first graph patteren im trying. Anyway you van make a quick video on this particular pattern? I love this pattern, but I am new to tapestry crochet. Once I get to the third color, do I have to carry the blue and the and white, or do I cut the blue and continue to carry the white yarn? You are only alternating between 2 colors at a time, so when you are done with the blue (assuming you are doing the same color scheme as me) you can just drop it and pick it up again when you need it near the top of the hat. You can cut it, but it will make more ends to weave in (you can do this if you prefer to not have the string on the inside. If you aren’t using that color again in the hat, you can cut it. At the end of every round for the body of the hat, are we supposed to sl st to the ch1 from the previous round or to the first sc. If its to the first ‘stitch’ as written in the pattern, then do we ch1 and then sc in the same stitch? Lovely pattern, thank you. Yes, you will work your first sc in the same stitch and then join to that stitch at the end of each round. I don’t have a PDF yet, I am sorry! Working on it! I don’t, I am sorry! I haven’t really used a loom, but this is good feedback. Thanks! Ok so this pattern is gorgeous. I actually used the Caron x Pantone yarn braid (2) and I love the results! If you’re bad at putting colors together, they have a bunch of different color combos that are so pretty! I used the terrarium greens and it looks like mountains. Also, my first time doing color work and it was so easy, the explanations are clear. Thanks for a great pattern! That is a wonderful idea! Those Caron x Pantone braids are divine! You are welcome, I am so glad you like the pattern! Is this hat available in smaller sizes? 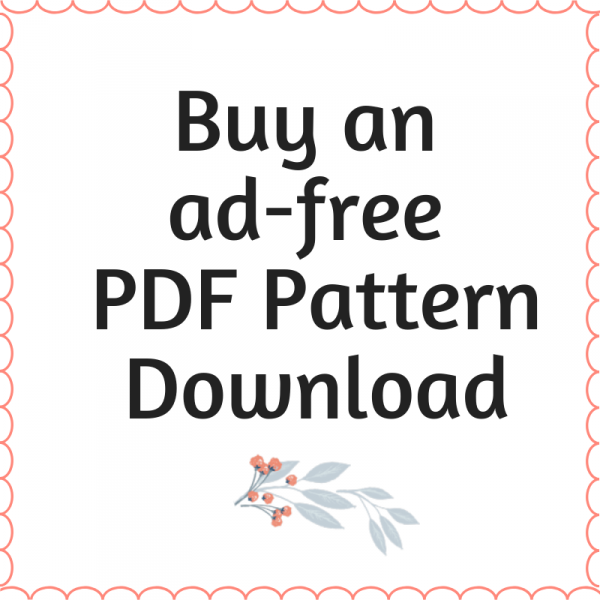 Can the pattern be adapted into a children’s size? No it’s not! but yes it can be adapted. It will be a bit a trial and error, but maybe try working 60 stitches around, repeating the graph only 10 times instead of 12. That might give you a toddler size. And then go down to 66 for an older child. I just made the hat for my 4 year old and originally did 60, it was working up too small so I pulled it out and did 66. It’s actually still pretty tight on my 4 year old, but fits my 2 year old. The fair isle pattern doesn’t have as much give/stretch as other stitches. I’m going to make a 2nd one in the original pattern size for my older child. The hat is gorgeous! Your pattern and video were very easy to follow. Thanks for sharing!! Thank you!I would go up a hook size or two. If it has zero stretch, you might need to loosen up with a bigger hook. The sc and carrying yarn definitely diminished the stretchiness, but it shouldn’t be tight. Hi! I’m just starting on this pattern and I’m stuck on the band. How is it 8 stitches in the second row on when you on have 7 in the patten? Am I reading the pattern wrong? No, 8 is a typo! Thanks for catching that! I love this hat! Thank you for including the videos along the way to help read the graph. It was very helpful as I have never used on before. Your explanation was perfect! yay! So glad you liked it! You are very welcome! I’ve made two of your hat patterns in two days. I love them! I finished this hat today and without any decreases in the top part it’s not closing well. Should I be decreasing in the last 4 rows? You can decrease! But it should simply cinch shut. Ugh, how do you keep it from being too tight?!? I’m paying really close attention to my tension, even frogged it and went up half a hook size. Still looks and feels like it’s tightening. I’m at a 6.5mm. Should I go up to an 8mm to get this fixed? Tips, tricks, advice, magic wand??? Hm. It’s getting more and more tight as you go? Are you losing stitches on accident? What yarn are you using? Some yarns are softer and have more stretch than others. I don’t think it’s because it’s work in BLO, my hat is soft and stretchy. Did you make a gauge swatch? oh wow! Yes, I think a bigger hook will hopefully fix your issue. Let me know! I’m having the same issue. Did the bigger hook solve the problem? I’m about to try my 2nd hat and would love to hear your results before starting. Thank you!! Hm. I am not sure, but it uses very little of each color. You could probably use scraps to make it. It starts on round 2. The first row across the top of the ribbed band is not included in the graph. I’m not seeing the sizing? For what size head does this fit? Thank you, I really adore this pattern! My question is a bit more specific than I indicated previously. My adult daughter has a head size of 20”, mine is 22”. 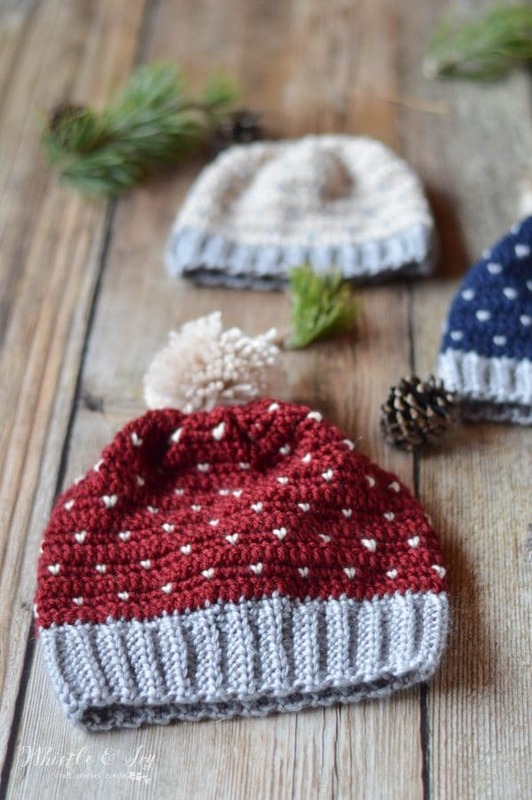 We wear the same size hat in knitted products, but we cannot wear the same size hat in crochet due to the limited stretch. According to your gauge it looks like it will come out to 20 inches and I’m guessing have a stretch to about 22. So, if I needed to go down a bit in size I would have to go down a smaller size in my hook. That sound correct? It should stretch quite a bit. What yarn are you using? But short answer, yes, if your hat is not stretchy, you will need to go down a hook size (or two). I was actually able to measure the band on my nieces head and I’m going to make hers first. I am using 60 stitches rather than 72, I’m using a size H hook and I am using the suoer soft Baby Bee yarn which is a #3. If it looks funky, I will go down to hook sizes and try to reach for the 72 stitches. 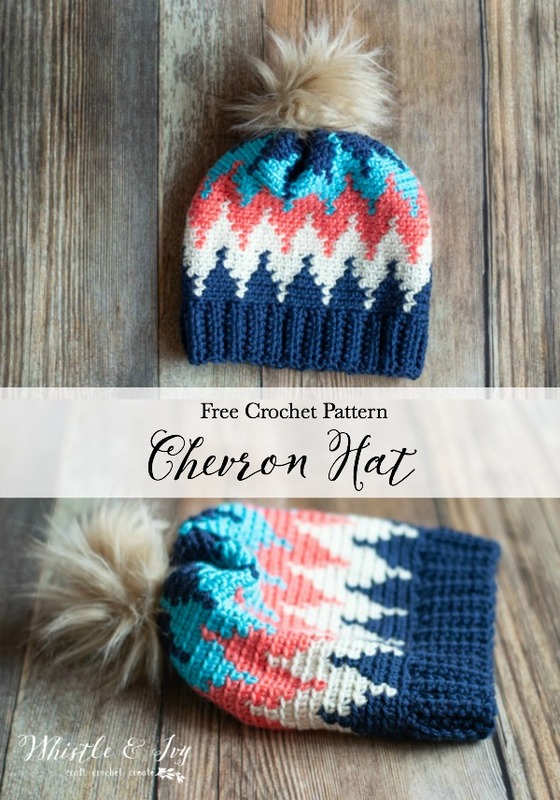 Hi what are the color names you used to make the chevron hat pictured? Thank you! Hi Terry! I used Coral, Navy and Off-White. This is so cute! I hope I can make i t soon! Not yet, I am sorry! I am working on it! Thank you Amina! I hope you enjoy making it.